Experience Alaska like never before! Kristi, a life long Alaskan, was raised in a log cabin by her pioneer parents. By the age of 20, she had already coached skating and skiing, commercial fished, and was running her own boat and crew. Commercial fishing for salmon, halibut, crab, and herring have taken her throughout Alaska's waters. A self-taught artist, working primarily in clay, she spends her free time sculpting in her Alaska studio. 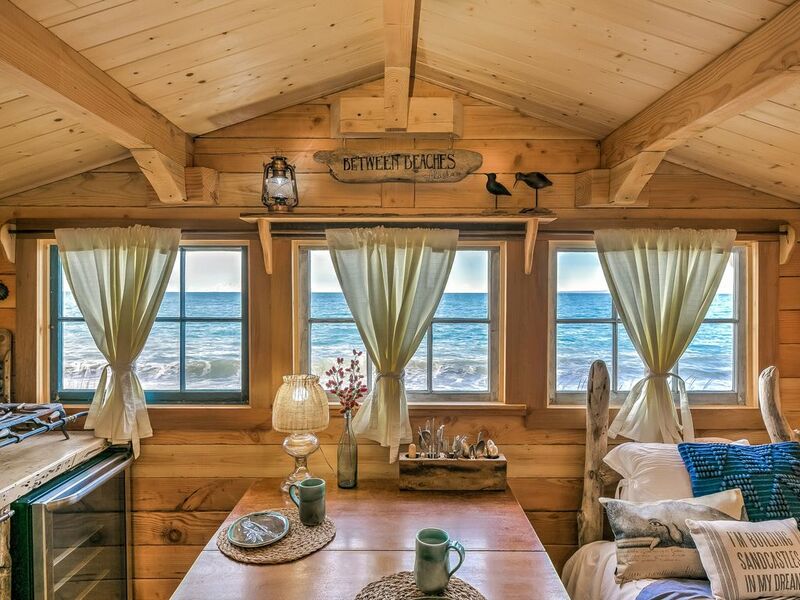 Aside from the cozy, well-appointed rental cabins (VRBO#s 993127, 661493, 449876) in a stunning and unique location, you are surrounded by art at Between Beaches. Ceramic sculptures as well as instillations made from copper, glass floats, drift wood, other beach combing finds, and clay are around every corner--even in your shower! Also, don't miss a tour of the art studio where Kristi works all winter to provide you with one-of-a-kind ceramic pieces and art kits that will provide perfect memories of your time at Between Beaches Alaska. The waters of Kachemak Bay are some of the richest in the world for sea life, offering visitors an unforgettable experience. Here you will see whales, bald eagles, sea otters and more from your doorstep. The unique geology of the area, has produced a fantastic setting for beach combing, tide pooling (best at minus tides), fishing and wildlife viewing. Watch the sun rise over one beach and set over the other. This cabin has a flush toilet inside the cabin and an outdoor artistic hot shower with a view! Wi-Fi from your beach chair or inside the art gallery, open anytime! every thing you need including an oyster knife! we provide one single and one double complimentary kayaks with each cabin, extra kayaks available upon request. Complementary row boat and kayaks with life vests included. 15 foot handcrafted wooden skiff with a 9.9 outboard for rent @ $150.00 per day. with 3 Adirondack chairs on each beach plus private sitting areas just above each beach. Access to the wood fired sauna anytime with plenty of wood, ax and chopping block near by. Access to the wood-fired hot tub (summer only). Chopping block and ax with plenty of wood! Greetings, You will take a scenic water taxi to reach us , departing from the Homer Harbor, it's 30 minute ride through beautiful Kachemak Bay State Park. Between Beaches is located on an ancient glacial land formation know as a Terminal Moraine. Named Macdonald Spit, it extends out into the bay. Because of this unique property we are situated on, we have it all! Here are long sandy beachs, running water, electricity, full sun any time of the day in one of the many private Adirondack chair seating areas, and no bugs! All this and still easy access to pristine hiking trails, and the quaint village of Seldovia. This land formation offers two beaches to explore, either by land or by sea. With two beaches, if it is breezy on one you simply walk 100 feet to the other beach! Our cabins were designed to fit between old growth trees, none were cut for these building sites and many reclaimed materials were used. We are a third generation family owned and operated business. come join us! Had a wonderful long weekend spent in the fisherman’s cabin. Kristi was super welcoming and the property is so uniquely beautiful! Beach bonfires, naps on the hammock, kayaking around the spit- it was perfect! Next time we will probably bring ATVs to get around easier - but other than, we wouldn’t change a thing. Thank you! We hope to come back again soon! Everything about this property was perfect. Loved the boat ride over where we could see the otters playing as we went across the bay. The cabin was so lovely, well equipped for cooking and super comfortable. The bed was divine and we slept so well listening to the waves wooshing on the pebble beach. Plenty of hot water and a very funky bathroom. We took the kayak out for a paddle and the water was so clear. There were otters so close that we could see what they were eating. We also loved watching the local bald eagle nests. The parents were teaching their young chick to fly. So special. It was fantastic sitting out in our deck chairs on the beach with a fire burning and watching the otters and the birds. So relaxing. Kristi was a great host and took good care of us. Not in your face but there if needed. We totally loved staying here and wish we could have stayed longer. Will definitely be back. Great cabin. Loved the views from both beaches. Kristi and her son were both very hospitable and ready to help if we needed anything. Would stay again. The cabin is charming and very comfortable. We loved drinking coffee in the beach chairs watching the sunrise and listening to the surf. Magical!! We had a fantastic stay at Between Beaches Fisherman cabin. Amenities were comfortable with a rustic flavor, a true Alaskan experience. We took our own boat across so had the option to travel that way for hiking and other out door adventures but there are lots of local activities (clam digging, hiking, kayaking, beach walks) and Kristi et all are well set up to help visitors get to trail heads that are further away, even offering a taxi to and from Seldovia for those wanting to explore an old Russian fishing town! Firepit on the beach and watching the sunset was our major evening activity. We brought much of our own food, cooked and used the outdoor grill, all of which was perfect. Everything you need for this trip was accounted for, we will be going back! I loved my stay at the fisherman's cabin. Kristi, the owner, is a wonderful artist which the cabin reflects. Her artwork makes the cabin seem enchanted. The location on the spit allows you to hear the ocean all night long and wake to the sounds of the birds. The eagles and otters kept me company as I walked the beach which is beautiful. I enjoyed exploring the tidal pools and took hundreds of pictures. Kristi was warm and inviting and made sure that I had everything I needed to make my stay comfortable. I even enjoyed the beach at night, I had a campfire on the beach with a glass of wine. I can't wait to return next year. MacDonald Spit is a very unusual land formation known as a glacial terminal moraine. The property is aprox. 75 feet wide with a beautiful sandy beach on each side. We have extreme tides here which offers us great clamming and tide pooling at minus tides. Please check tide tables. A short land taxi ride can take you to the village of Seldovia from our trail head. If it is windy on one beach you can crossover to the other. This cabin is smoke free. Guests who smoke in the cabin will be charged a $300 cleaning fee. Kayaks are now included with nightly rental! Dogs must be on leash during their stay.